I don't really take care of my hair often at all, that's mostly the reason why I shaved my head. Life was easier with a shaved head I would just wake up and leave! However, my vanity has gotten the best of me and I want hair in my graduation photos an ill admit sometimes I miss my long tresses. The best way to take care of any hair time is to keep it healthy and moisturized and homemade avocado hair mask are the best. Scoop the avocado out with a spoon and place into a bowl. Pour olive oil into the bowl and mash with a fork or spoon. 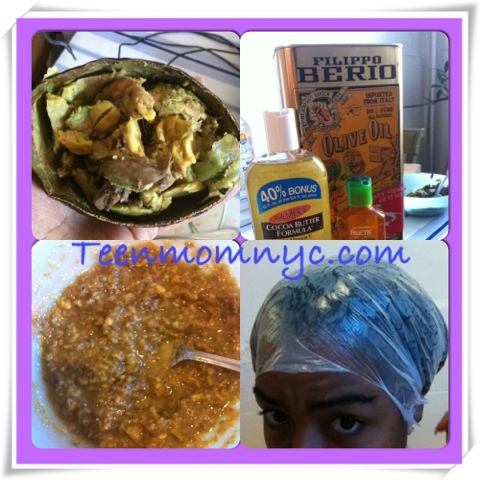 If you have a food processor or blender you can also use that to create a super smooth hair mask. Add your scented oils and or honey for scent. Do not get stuck in thinking everything needs to be measured out. I personally like a super ripe avocado and extra oils. Apply the mask to your hair. I find that parting your hair into different sections really helps. Be sure to get your scalp too! When you're done applying the mask place a shower cap over your hair and leave the mask in for as long as you want. Personally I prefer wrapping my hair in Saran Wrap or a plastic bag, this helps make sure the hair mask moisturizes the scalp ad hair. When you decide to wash out your hair mask just shampoo and condition like you usually would. Try the mask out and let me know how it goes!